I was recently asked to review a product from CSN Stores. CSN Stores carries a large selection of different products. You really can find something for everyone on your shopping list. You can purchase serger sewing machines, cookware, outdoor gear, toys, bedding, and even shoes and accessories. Christmas is less than a week away, and I always have a difficult time selecting gifts for my husband. He loves to read, but I don't dare pick out a book for him. He loves music, but we don't always share the same taste. He also loves basketball. I would have loved to buy him a season pass to watch the Miami Heat play, but we live in Idaho, and he wouldn't get any use of it (and it isn't really within our price range). 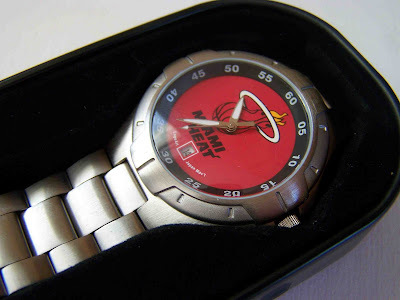 I was thrilled when I came upon this Logo Art NBA Miami Heat Men's watch. It is a practical gift (which I love), but it is also personal. My husband will now be able to show his team pride, but without having to wear a foam finger and Dwyane Wade Jersey. It is available at CSN Stores, and I couldn't be happier with the purchase. 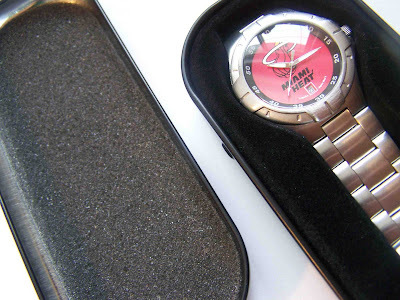 The watch itself comes with a stainless steel adjustable bracelet. 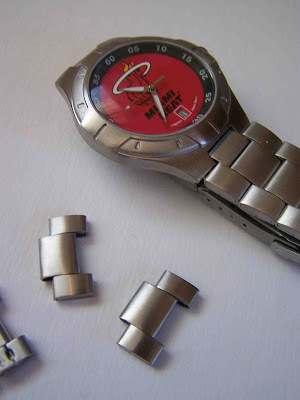 It has multiple removable links on either side of the watch clasp. This is very appreciated in our home. My husband has medium sized wrists, and would drown in the watch if it weren't adjustable. I am confident that most men would be able to wear this watch. We removed two links on each side, and adjusted the clasp closure. It now fits very comfortably on his wrist. There are an additional two links on either side that could be removed to fit this to a youth size wrist. I really like the style of the watch bracelet. I think that it is nice enough to wear with most anything. The full color dial is sharp, but discreet. I appreciate that the watch face has the date, and also numerical marking for easy reading of the time. The watch looks sharp and well constructed. My husband loves the watch, and can't wait to wear it....after Christmas. The watch also comes in a nice sturdy storage case. It will be nice for the watch to have a home when it is not in use. I'd highly recommend the watch, and shopping with CSN Stores. I've had a great experience working with them. 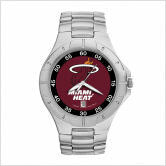 By the way, it is much cheaper to buy Logo Art products from CSN Stores, than to purchase them through NBA Stores. Do you have any great guy gift ideas? It is always hard for me to shop for brothers, fathers, and husband. Little guys are a bit easier...trucks, trains, and dinosaurs. Any great crafting gifts for guys? Thanks! Good suggestion! I will keep in mind to have such a picture for future postings!